There are many recipes for these cookies. 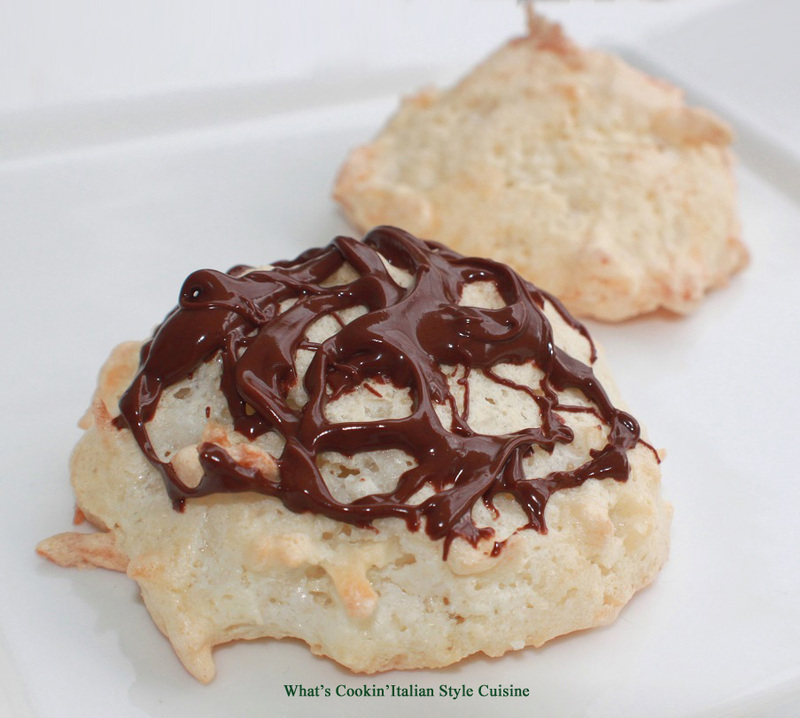 Easter Coconut Macaroon Cookies are a cookie favorite that mom use to make every year for Easter. Some folks use condensed milk, we she never did. I have tried some of the other recipes along the way and always come back to this one. When I was a little girl, mom would make these as a treat at Easter. I could never understand why we only made these once a year because they are by far the easiest cookie to make and so delicious. I love that there aren't many ingredients. Mom and I were absolutely huge lovers of coconut. Sometimes she would even tint the coconut green first, let it dry and add to looks like grass. I think back in those days coconut was something of a luxury to buy back in the 1960's. I made these for Easter this year in her memory. They look adorable decorated with jelly beans as she did for the grandchildren back then. Get creative, they taste like a famous candy bar. With a heavy duty electric mixer and whip attachment, add 4 egg whites to the bowl. adding the 1/4 sugar a little at a time and beat until stiff peaks not dry. I then add 1 drop of coconut oil flavoring or 1 teaspoon of vanilla. In another bowl, combine 1/2 flour, 1 cup sugar, 1/4 teaspoon salt and 2- 1/2 cups of coconut shredded mix all together evenly. 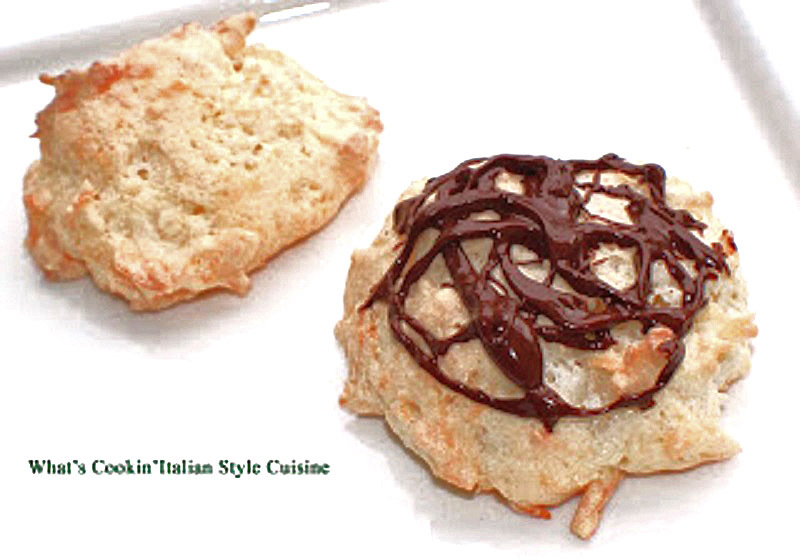 Gently fold the egg whites into the flour/coconut mixture until moistened adding a little at a time. Drop by tablespoons or teaspoons full onto parchment or a silapat mat. Bake in the preheated 325 degree hot oven until the top starts to brown. Remove to cool to a baking rack with a thin metal spatula. You can drizzle melted chocolate add the jelly beans for a birds nest look on top when cooled or leave plain. Love, love, love macaroons and their lightness of being. Jellybeans on top would be fun but I am loving the chocolate drizzle. Your mother was right - some things are so special because you make them once a year! 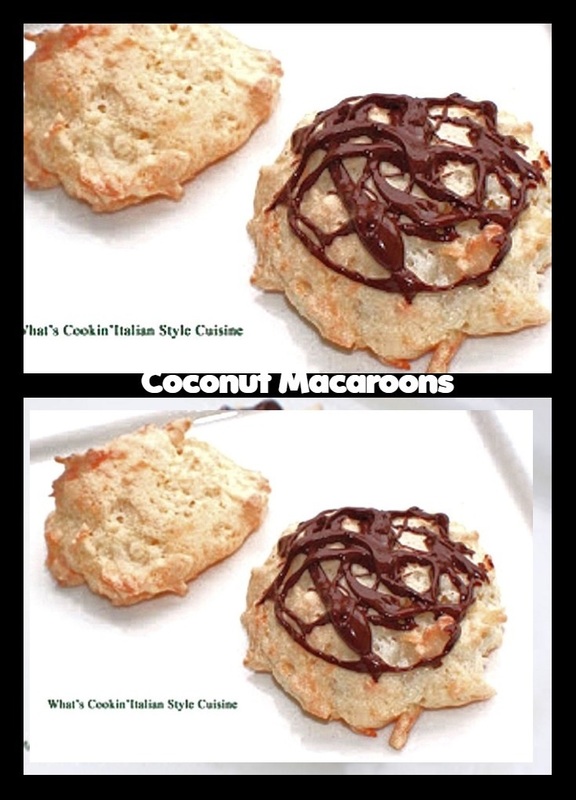 I love coconut and macaroons are a favorite. I'm pinning this to try very soon. Happy Easter. I love these gorgeous egg white cookies too. I love how these macaroons are so easy to make. Happy Easter!